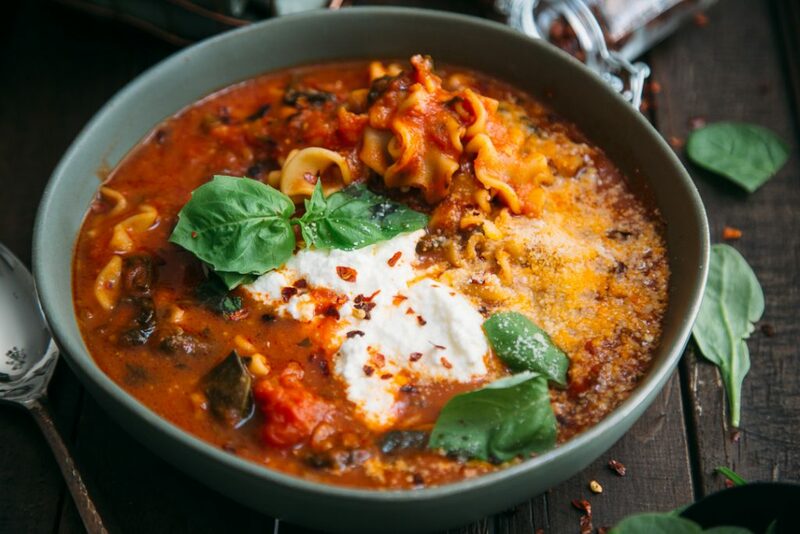 LASAGNA SOUP is totally a thing, guys!! 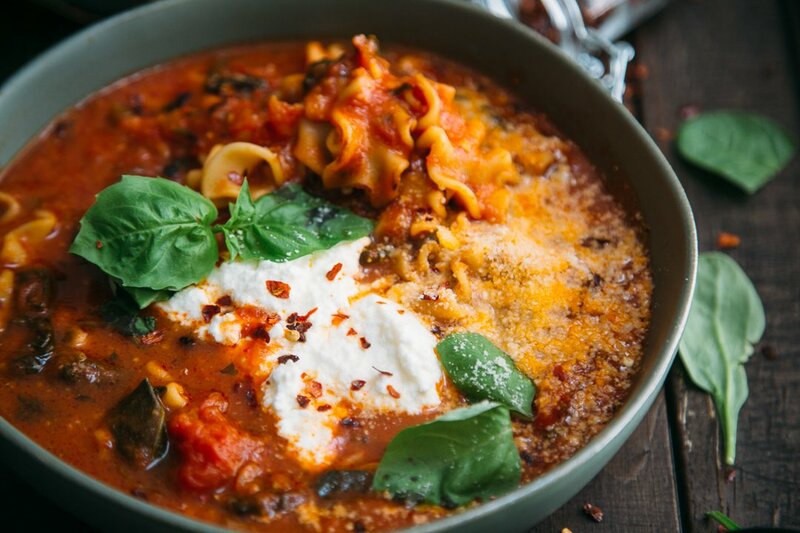 I’m always disappointed by how my lasagna turns out so Im always taking the easy way out- like these Mexican Lasagna Roll Ups– or my Eggplant Parm (which is an AMAZING recipe if you haven’t tried it) and now this soup!! I made it in the Instant Pot because that thing is just sitting in my cabinet begging to be used! Also- Im all for one pot meals these days- because my belly is grown and ya girl is not trying to slave away washing dishes all day. 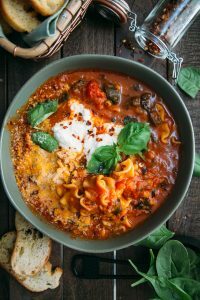 If you don’t have an Instant Pot- you can still make this recipe- just cook the pasta separately and add it into the sauce/soup part. You don’t need to pressure cook at any point. 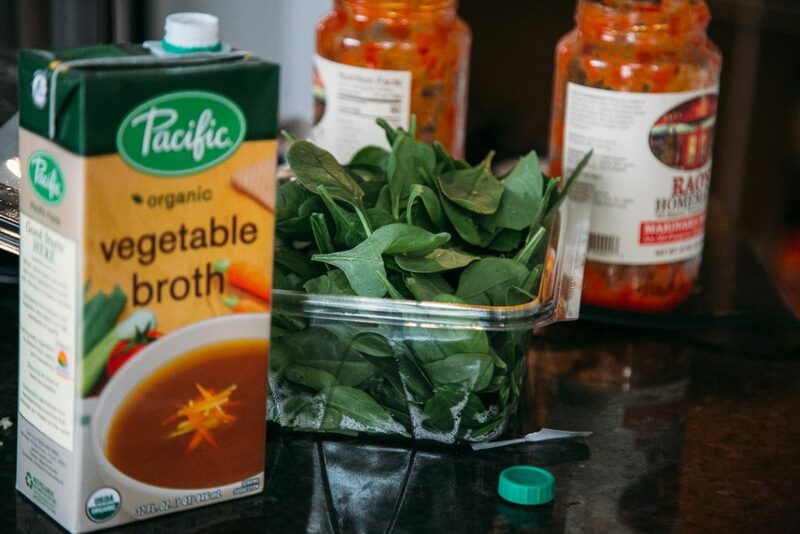 Just follow the instructions about the ingredients (ignoring all of the IP settings) and add the vegetable broth in one cup increments until you find it has a soup like consistency- it might not require the entire 5 cups of liquid my recipe calls for in the IP). I use Rao’s marinara and arrabbiata sauces because I find them to be much less tangy than using canned tomatoes as most IP lasagna soup recipes call for. 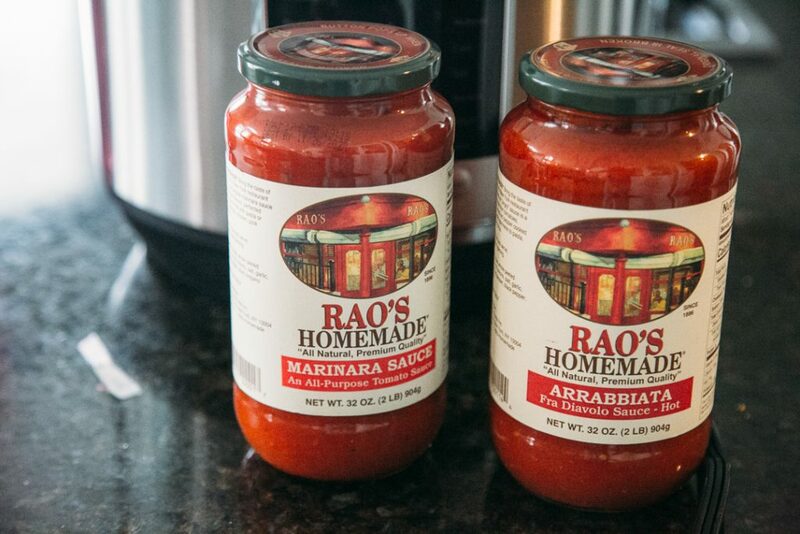 I trust the ingredients in Rao’s sauces and because they’re already so well seasoned and balanced- its an extra boost in the recipe! This recipe makes quite a lot (for some reason my IP recipes always feed an ARMY) so be prepared for lots of leftovers- or freeze this! Make it with meat: I would personally add some ground turkey or sausage in here! Or take the easy way out and add in some frozen meatballs- easy peasy! Set your IP to saute mode and add two tablespoons of oil. Once the oil is hot, add the serrano chilis and oregano and let splutter for a few moments. Add the onions and peppers and continue to cook for 3-4 minutes. Add garlic- stirring continuously so the garlic does not brown. 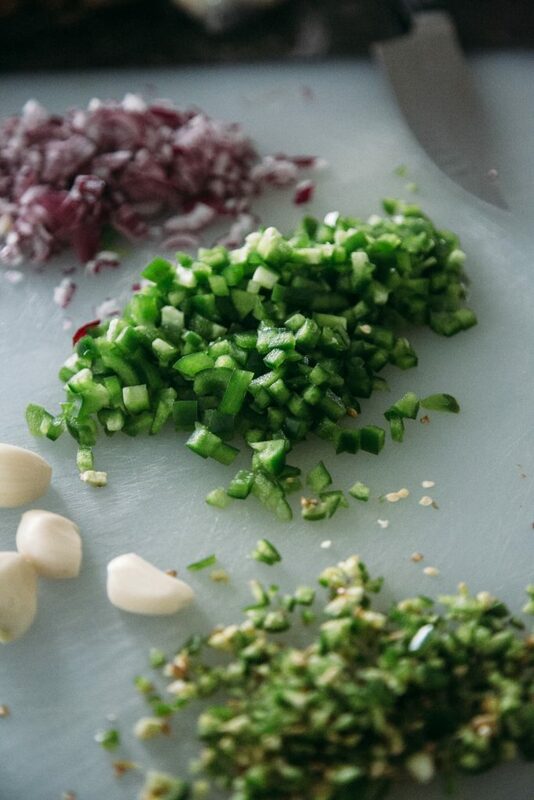 Once the onions and peppers have softened a bit- add in the rao's sauce, spinach, vegetable broth, 1 cup water, bay leaf, scallions, cilantro, and parsley. Stir well for a few minutes until all the ingredients are incorporated. Add in the pasta. 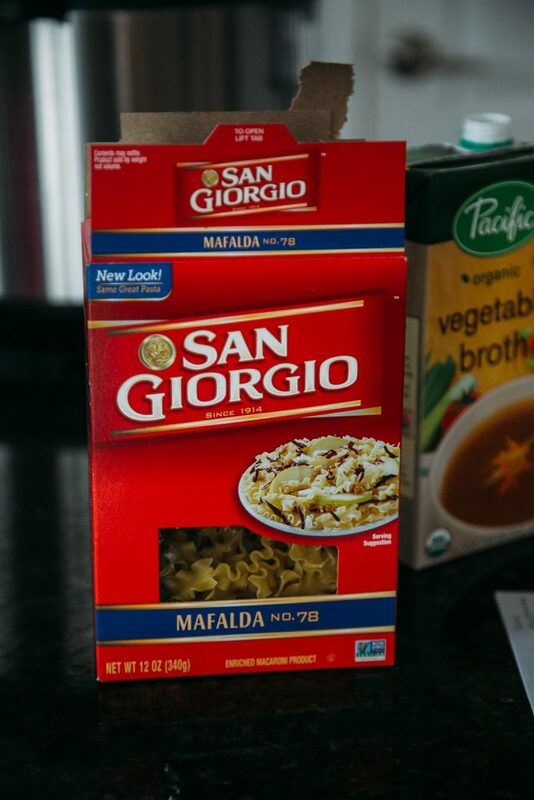 Hit cancel on the IP and switch it to Pressure Cook on High Mode- for 3 minutes (If you use a different pasta than I did- just cut the cooking time on the box in half for the pressure cook time- my box said 6 minutes to al dente- so I cooked the pasta for 3 minutes). After 3 minutes- do a manual release (use a towel to protect your hands). Once the silver pin drops- open the IP. The consistency should be soupy- if it is too thick- add water in one cup increments until you reach the desired consistency. If your pasta is undercooked- just set it on saute mode and let it simmer until the pasta cooks. Add in the parmesan, mozzarella and ricotta. Add more or less cheese as you like- add salt per your taste ( I did not add any salt in my recipe). I made this last night for dinner and it was incredible! Super tasty and definitely glad I got the Rao’s sauce. You can tell the difference with the quality. We have lots of leftovers for this weekend!